Beautifully remodeled split level home featuring a numerous amount of upgraded amenities. Enter into an open great room with 3/4 inch thick hard wood flooring. The adjoining kitchen and dining area offers maple cabinetry, a granite counter top with ceramic tile back splash and stainless steel appliances. A set of sliding glass doors lead out to a rear deck. There is a bedroom downstairs that can easily be used as a family room/den/office/library or hobby space. The top floor of the home offers three spacious bedrooms, all with closets and a very large full bath with a ceramic tiled floor, subway tiled tub surround, new toilet, vanity and sink. The downstairs full bath has a beautiful new vanity, toilet, ceramic tiled floor, fully tiled shower stall and separate laundry closet. The attached garage offers parking for a car and additional storage. There is recessed lighting, a coat closet and a beautiful "driftwood" accent wall in the great room/dining area. At the rear of the home there is a storage shed and a wooded perimeter for privacy. 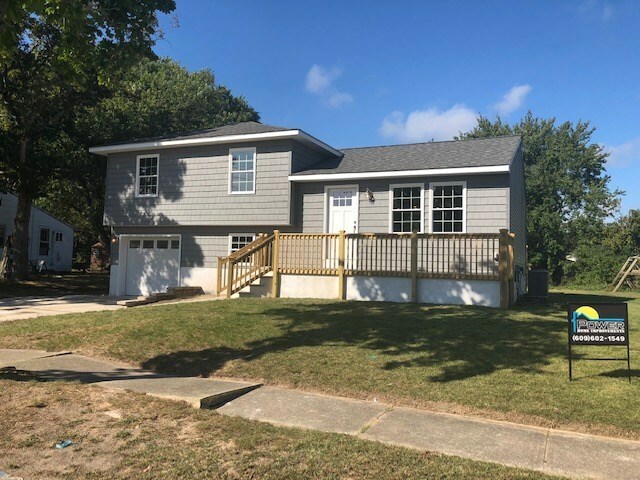 Enjoy a front porch or rear deck.This home is equipped with a new roof, windows, heating, air conditioning, water heater, exterior and interior doors are and siding.